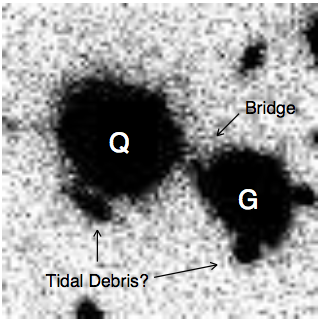 Figure 1: R band image of the quasar-galaxy pair with the gaseous bridge connecting the two. As mentioned in yesterday’s astrobite, the study of hierarchical theories of structure formation is prevalent in modern research. While many observers look at the before and after (much as a chemist would do with a reaction), much has been learned by observing systems caught in the act of merging. In addition to observations, astronomers have also used N-body simulations to fully appreciate the entire process of merging systems from beginning to end. How the merging activity molds a new galaxy turns out to be highly dependent on properties such as the mass ratio and gas content in the colliding systems. In this paper, the authors examine an interacting quasar-“Green Valley” galaxy pair at a moderate redshift of z=0.37 that was serendipitously discovered in a previous survey of distant quasars. Despite its great distance, the authors identify a gaseous bridge (that should be invisible) connecting the two galaxies making this a unique and fascinating system in which to study the ongoing merger process. 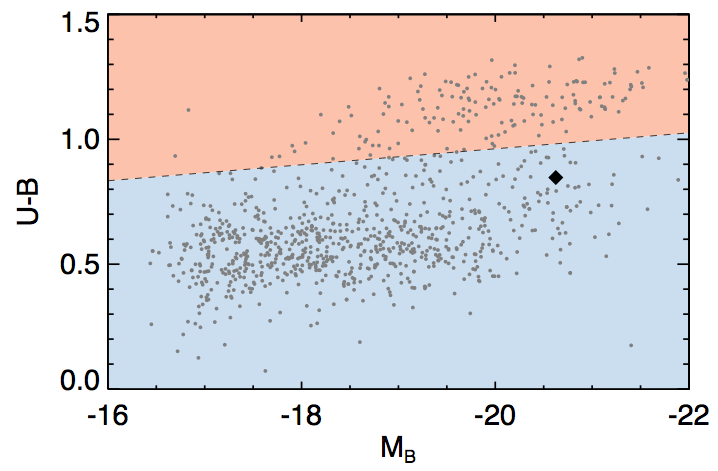 Figure 2: A color-magnitude diagram that shows the "red sequence", "Blue Cloud", and less populated "Green Valley" where the companion galaxy (large point) lies. Galaxies tend to fall in two camps when they are plotted on a color-magnitude diagram: (1) current star forming (usually disky or irregular) “blue cloud” galaxies or (2) “dead” red sequence galaxies (usually spheroidal/elliptical) with mostly older stellar populations. The “Green Valley” is a less populated region in color-magnitude space where various processes can be at work (see Figure 2). One idea is that recent star forming galaxies’ stellar populations are evolving passively (with no major mergers) toward the red sequence. It could also be a result of viewing angle, where we observe a blue star forming galaxy edge on such that the dust in the galaxy makes it appear redder. In another scenario, these systems are experiencing merger-induced starbursts and AGN activity that will eventually lead to a “dead” red galaxy. Mergers can lead to star-bursts/AGN activity because tidal forces exert torques on a galaxy disk forming a bar which works to funnel gas towards the center of the galaxy. This may spur a great amount of star formation because of the increase in density and lead to elevated levels of AGN activity if that gas manages to make it close to the supermassive black hole. The famous correlations between the mass of the supermassive black hole and its host galaxy are more easily explained if there is simultaneous evolution. 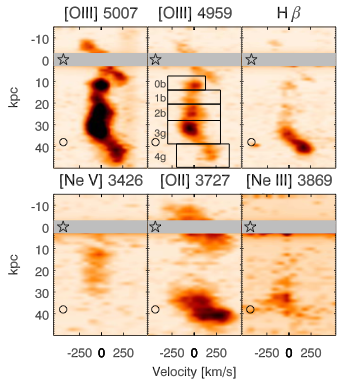 The authors believe that the system falls into the post-starburst class because their observations point to a period of elevated star formation in the past. Their best models predict this happened somewhere around 800 Myr ago possibly correlating with the first passage of the merger. Figure 3: Gas bridge connecting the two galaxies in different bands. As mentioned before, the authors also detect an interesting bridge of emission that connects the quasar and galaxy. The bridge emits strongest in [OIII] and H and because the higher ionization state lines are brighter closer to the quasar, it is surmised that the quasar is photoionizing (the paper rules out shock ionization) the majority of the gas. If correct, this allows the bridge to be well studied using low density astrophysics used commonly in ionized regions in our own Milky Way! In fact, the authors find estimates of the material’s dynamics, column density, mass, temperature, metallicity, and volume density. By studying the kinematics of the gas, it is found that the gas seems independent from the rotation observed in the quasar’s host galaxy and the “Green Valley” companion, leading to the guess that the system has experienced a first fly by and the stripped gas has started to self gravitate between the two galaxies (hence the observed lumpiness). The authors also make many estimates of properties in the two galaxies themselves such as star formation rates, black hole masses, and dark matter halo masses. Other questions this paper raises are: (1) Has the “Green Valley” galaxy already undergone a quasar phase? (2) How does a first passage quasar affect the merger vs. a merger without one? (3) Why does only one of the galaxies have an active nucleus while the other does not? Stay tuned for a second paper from this group where they plan to focus more on the quasar.